How do you depict jealousy in art? Many communities consider graffiti art to be a menace and defacing of property. The primary reason for this is that some graffiti artists post art on private property without the permission of the owners. At any rate, graffiti art is illegal in most communities and the artists usually have to run and hide from the law after leaving their mark. Graffiti art is not the same as tagging. Tagging usually involves only a black spray can that is used to paint initials or other tag. Usually the tagger just wants their name to be known in the area and feels a sense of pride when he/she sees the tag. Graffiti art involves the use of color and may or may not contain alphabetical letters. Much of it is beautiful to behold, but is usually temporary as it is painted over by business owners. 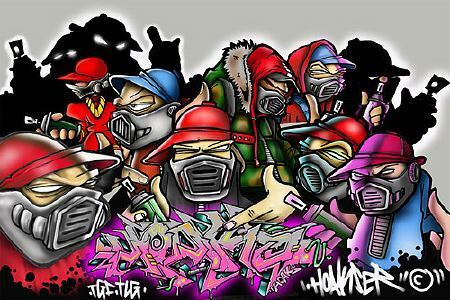 Graffiti artists have also been fined an arrested. When a good graffiti artist paints a work of art with the permission of the owner of the property, it not only can be considered a work of art, it can be lucrative for the artist. There is a man who decided to make his art "legitimate" and take it off the street and do it in a studio. 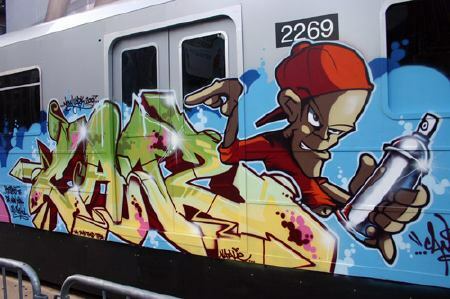 Mike Graves used to paint graffiti on trains and buildings. Now he paints on canvas. Mike Graves is shown in his Murphy Building studio on the south side of Indianapolis. There is money to be had for some graffiti artists. Keith Haring, a graffiti artist in New York painted simple white chalk figures on unused advertising panels on billboards across the city. Soon many New Yorkers began admiring his work and he was invited to exhibit his work. He received international recognition. He became a wealthy man, but his life was cut short when he died of AIDS. Mike's work is also becoming popular. He has a show this month at the Indianapolis Artsgarden called Art & Soul on February 26. The price range of his work is between $200 and $1,200. He uses acrylics, ink, markers, oil, steel, wood and photography. He has been awarded several awards and had his work recognized at the Seattle Er0tic Festival. He is probably one of the worst graffiti graffiti artist I have ever seen. I cant see how he can claim to be an artist when he has no control over letter form what so ever. An interesting form of art is hand paintings. No, not painting with your hand- painting ON your hand. Artist Guido Daniele from Milan, Italy began his style of super-realism as an illustrator with various advertising companies. In 1990 he began using body painting for his advertising. He paints models' bodies for commercials fashion events and exhibitions. Enjoy the video below of a series of his excellent hand paintings. How do you depict jealousy in art? That is a question two artists posed to each other. Artist Vikki North e-mailed me and wrote she said to Michael Edens of MDE.ART, "I’ve got one for you. How would show ‘Jealousy’ in a singular image?... How do you show that ugly green eyed monster - 'Jealousy' without getting cartoon-like?" Vikki says she was sure she stumped Michael. He wrote back that he could do it and dared Vikki to do the same. Soon he came up with an image that represented the emotion. Vikki returned the challenge. Judge for yourself- which image below depicts the emotion the best? Says Michael, "The experience instilled a desire to make art challenges more inclusive and accessible to artists and art patrons." 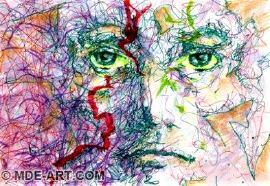 He presents the challenge in a joint effort called, "The Artist Challenge- A Private Art Club." This is Vikki North's response to the challenge. Does the painting successfully define the lines that separate anger from jealousy? 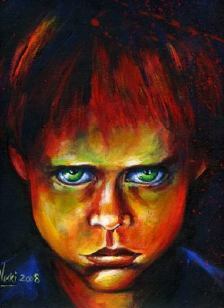 Artist Michael Edens responded to the "Jealousy Challenge" with the painting above. The face is separated by a jagged line with one side of the face brighter than the other. Does the red jagged line separate the side that is content from the side that longs for something it doesn't have? Following that challenge, Michael said to Vikki, “I’ve got one for you: How would you portray the 1956 French film ‘The Red Balloon?” Vikki had never seen the film, so she had to do a little research on the movie. The movie is a story of a young boy who discovers a large helium-filled red balloon. He soon finds that the balloon has a mind of its own. Vikki responded with art of her own. Says Vikki, "I worked out the design and painted for several hours. Half done, I had a horrible epiphany: it was all-wrong! The film is about opening up the world and imagination of a little boy. So, I started again." Her result is online. The two artists have continued their challenges each month and their challenges have expanded to additional artists. Since then they have created a representation of Dan Eldon, an humanitarian who drew attention to the poverty and starvation of Africa's population. The following month they challenged each other to create art that depicted "Hope." Artists everywhere can now join them in the challenge. Says Vikki, "I equate it to the fact that there is nothing more stimulating to any artist than a challenge from another artist. It’s a tremendous exercise for all artist and just great fun. We even have craftsmen and writers that want to be a part of the challenges." You can join the challenge by visiting their website. Vikki North is one of a kind, and together with Michael, they make an exceptional team. Long before the Challenge, Vikki was generating both written and visual content of a special kind. Pay a visit to her blog and scroll back in time to some of her posts and artwork over the past year, and you will witness an exceptional collection of artistic expression. Vikki's stories lure you in and you hang onto every word as you make the twists and turns down the journey. She brings joy into my life on a daily basis. I'm sure that her work will affect you similarly. Go there, get to know these people! They are truly incredible and will always cheer you up just when you thought you didn't even need any more cheer! Oh, did I tell you they are amazing artist!